It’s starting to feel more and more like an Orwellian nightmare in Turkey as local authorities have blocked access to Wikipedia after the hugely popular online Encyclopedia refused to remove content suggesting Turkey was in cooperation with “terror groups”, according to official sources. On Saturday, the Turkish government blocked access to all content of the online encyclopedia Wikipedia. The blockage, affecting all language editions of the website in Turkey, was detected at 05:00 GMT. It is not the first time Turkish officials find themselves in contact with the website over content disputes, and the blockage was put in place after a denied request for the content in question to be removed, state-run Anadolu Agency quoted the Ministry of Transport, Maritime and Communications as saying. “The loss of availability is consistent with internet filters used to censor content in the country,” Turkey Blocks said. The organization added that an administrative order was usually followed by a full court order. However, some internet users who happened to be more prepared were still able to access Wikipedia through the use of virtual private networks (VPN) like TorGuard. In an attempt to justify the Turkish government’s move, ministry officials were quoted as saying that “[Wikipedia] has started acting as part of the circles who carry out a smear campaign against Turkey in the international arena, rather than being cooperative in fight against terror.” According to the report, the website tried to show Turkey “at the same level and in cooperation with terror groups”, which was deemed unacceptable. Critics on social media were prompt to arise, and users speculated the blockage may have to do with this month’s controversial constitutional referendum or an entry about Turkish President Recep Tayyip Erdogan. Turkey’s private NTV television network, which had already drawn negative attention for censoring anti-government content, declared access to Wikipedia was blocked because of its content supporting terrorism. It also said the block was implemented to restrict access to the articles “placing Turkey on the same level as the ‘Islamic State'” despite multiple requests to remove said content. 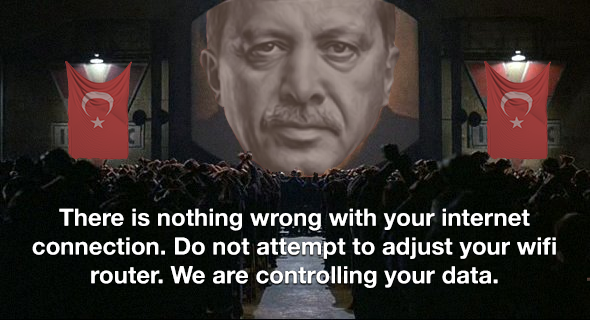 For the block to be lifted, Wikipedia will have to comply with four specific demands from the Turkish government, NTV said: opening a representative office in Turkey; complying with court orders; acting in line with international law; and refraining from taking part in “operations to denigrate” Turkey. The Wikipedia Foundation said that it is “committed to ensuring that Wikipedia remains available to the millions of people who rely on it in Turkey. To that end, we are actively working with outside counsel to seek judicial review of the decision affecting access to Wikipedia. We hope the issue can be resolved promptly”, in response to a Deutsche Welle inquiry. A volunteer from Turkey Blocks told DW she suspected Turkish authorities of using filtering (or “Deep Packet Inspection”, also known as DPI) used by some countries for surveillance and censorship: “Normally http websites are easily blocked, but to block a single URL more advanced techniques have to be used,” she said. “Since Wikipedia uses https protocol, it’s not possible to block a single URL, that’s why Turkey’s Information and Communication Technologies Authority (BTK) blocked the entire website,” she added. Over the past few years, Turkey has temporarily blocked access to multiple websites, including Twitter, Facebook, and YouTube, specifically in the wake of major events, such as mass protests or bomb attacks. Blocking access to certain websites and content has become common practice in the country, especially during terror attacks, mass protests or even in response to some internet companies’ failure to remove sensitive content, and hundreds of websites critical of the government are already blocked in Turkey. Local authorities often request social media and internet companies’ cooperation in removing content for defamation or so called terrorism, particularly when said content is related to Kurdish militants. Following the block, Wikipedia quickly became the top trending hashtag on Twitter, both worldwide and in Turkey. Other websites, including leading social media platforms, appeared to be working normally. The move is proving even more worrisome as basic freedoms seem to be more and more restricted as a result of the deterioration in the rule of law and democracy in the country. It is far from being the first time the Turkish government restrains access to popular platforms, and officials tend to justify the moves by saying such measures are always temporary and needed for national security reasons, but critics see the blocks as further restrictions on civil liberties under the rule of President Recep Tayyip Erdogan. However, the blockage of Wikipedia caused a massive uproar on social media in Turkey, as users angrily denounced the decision to restrict access to one of the world’s most popular websites and information source. Cautious internet users frequently rely on VPN services to maintain their access to sensitive content. However, as VPNs are becoming more popular to bypass local bans and censorship, authorities are also becoming more creative in finding ways to block them: some users have already reported their VPNs were blocked, thus further keeping them from accessing censored content. TorGuard users can expect un interrupted VPN access anywhere within Turkey when our Stealth VPN options are enabled. Here at TorGuard VPN, we believe every human being is entitled to the free flow of knowledge and information available on the open web. We remain committed to providing un block-able VPN access to those in regions affected by extreme internet censorship. TorGuard VPN users in Turkey can be assured their VPN access will remain un-interrupted and can tunnel through even those toughest DPI (Deep Packet Inspection) blockades.